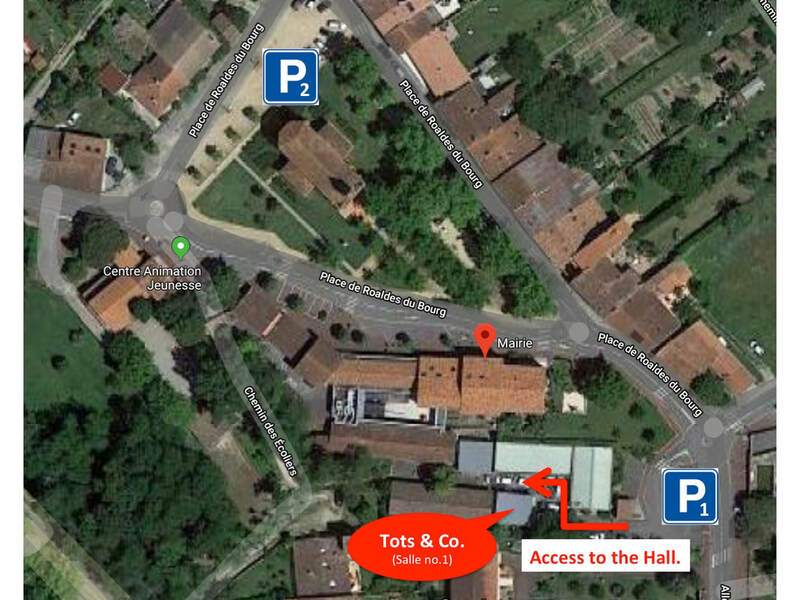 Our Address is: Salle no.1, Chemin des Ecoliers, 31840 SEILH (chemin des Ecoliers is a footpath). There are two car parks; the nearest car park is just off the small roundabout on Allée Emile Ader (shown as P1 on the map below) and the other larger car park is at Place de Roaldes du Bourg (shown as P2 on the map below) which is located by the large church in the centre of the old village of Seilh. Access to the hall is indicated on the map below and is accessible via the small car park (P1). Follow the road and you will come to a metal fence and gate, our hall (Salle no.1) is on the left. *It is best to bring a pushchair for your baby rather than carrying the car seat, you can leave the pushchair outside the hall*.